Thanks to Jill and Dave who brought this to the latest gathering of our gourmet group. Wow… was this a hit at our Tuscan themed dinner! Combine the first 4 ingredients in a blender; purée until smooth. With machine running, slowly add oil, drop by drop, to make a creamy dressing. Transfer dressing to a bowl and stir in ¼ cup Parmesan. Season to taste with salt and pepper. Cover and chill. DO AHEAD: Dressing can be made 2 days ahead. Keep chilled. 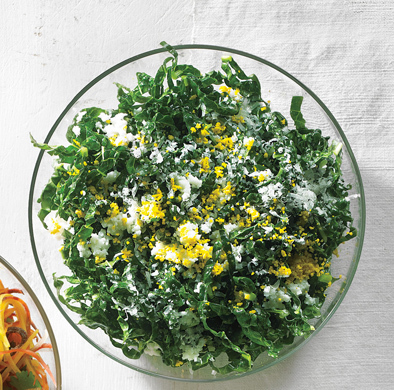 Toss kale and dressing in a large bowl to coat. Season to taste with salt and pepper. Top with remaining ¼ cup Parmesan and sieved eggs.